The Dow Jones Industrial Average is flat this morning as the September FOMC meeting starts today. Dow Jones futures are up just 15 points ahead of a busy day of earnings reports from firms like Bed Bath & Beyond Inc. (Nasdaq: BBBY) and FedEx Corp. (NYSE: FDX). 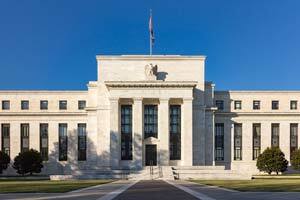 Today is the first day of the Fed Open Market Committee's September meeting. The central bank is expected to discuss the process of winding down its $4.5 trillion balance sheet. In addition, investors will be looking for clues into the timing of the Fed's next interest rate hike. The CME FedWatch Tool projects about a 50% probability that Yellen's team will take action on interest rates in December. However, with inflation still low and unemployment near record lows, the pressure is on the bank to make a decision soon. The toy sector isn't reacting well to the news that Toys R' Us has filed for bankruptcy. Shares of Hasbro Inc. (NYSE: HAS), Mattel Inc. (NYSE: MAT), and Jakks Pacific Inc. (Nasdaq: JAKK) all saw their stocks plunge Monday as a result. The three firms have generated about 10% of their annual sales from the retail chain in recent years. This is just the latest example of the impact Amazon.com Inc. (Nasdaq: AMZN) has on the U.S. economy. A light day of economic news includes two reports on the health of the U.S. housing market. Look for an update on housing starts and one on building permits. The reports come a day after the NAHB Housing Market Index for the month of September fell three points, from 67 to 64. Builder confidence fell thanks to negative effects from Hurricanes Harvey and Irma. Crude oil prices are slightly up as traders focus attention on Hurricane Maria, which is directing itself straight into Puerto Rico. The hurricane is not expected to make landfall in the continental United States at the moment, but things could change in the coming days. The WTI crude oil price today added 0.8%. Brent crude gained 0.4%. Shares of Equifax Inc. (NYSE: EFX) are under pressure, falling another 3% in premarket hours. The downturn came after the firm announced that it had been hit by another previously undisclosed cyber breach earlier this year. In addition to Congress starting its investigation into the company's practices, reports indicate that financial regulators are looking into accusations of insider trading among executives at the firm. The stock has lost one-third of its value since its July breach, which affected 143 million Americans, was announced earlier this month. Shares of Steelcase Inc. (NYSE: SCS) are up 2.8% after the company topped Wall Street earnings expectations after the bell Wednesday. The company reported earnings per share (EPS) of $0.26 on top of $775.6 million in revenue. Wall Street expected EPS of $0.23 on top of $757.4 million in revenue. Shares of AutoZone Inc. (NYSE: AZO) are on the move after the company reported earnings before the bell. Wall Street analysts expected EPS of $15.14 on top of $3.49 billion in revenue. The stock added 1.4% after the firm beat top- and bottom-line estimates. The company reported EPS of $15.18 on top of $3.513 billion in revenue. In additional earnings news, keep an eye on FedEx Corp. (NYSE: FDX). The shipping giant will report quarterly earnings after the bell Tuesday. Markets anticipate EPS of $3.17 on top of $15.369 billion in revenue. The report is critical for many investors who will be looking for clues into the impact of a major cyber breach that affected the company in June. Hackers used a malware attack to disrupt operations of the firm's TNT Express subsidiary. Many analysts expect that the financial impact of the attack will be substantial. Tuesday will feature a busy day of earnings reports. Keep an eye out for updates from Adobe Systems Inc. (NYSE: ADBE), Bed Bath & Beyond Inc. (Nasdaq: BBBY), Copart Inc. (Nasdaq: CPRT), AAR Corp. (NYSE: AIR), Apogee Enterprises Inc. (Nasdaq: APOG), and Neogen Corp. (Nasdaq: NEOG).